Lawmakers and experts alike criticized the White House for refusing to release publicly the full text of the deal, which temporary halts some of Iran’s nuclear program in exchange for billions of dollars in economic sanctions relief. Ros-Lehtinen said on Tuesday during a HFAC hearing about the deal that even members of Congress must climb through hoops in order to view the deal. "Why is it that members of Congress have to go to a super secret location, a cone of silence … to look at the deal?" Ros-Lehtinen asked a panel of nuclear experts. Ros-Lehtinen described the secret document as "quite eye opening" and wondered why the Obama administration continues to keep it under lock and key. "It’s a very easy to read document; one doesn’t have to be as expert," she said, urging other members on the committee to examine the deal. "If this is such a great deal and so good for peace and diplomacy in our time why is it held in secret?" Ros-Lehtinen asked. "If the administration is proud of it, I think they should highlight it." Nuclear expert Gregory Jones expressed concern that the administration "does not fully understand" the deal it signed. "It does bother me" that the deal has been kept secret, said Jones, a senior researcher at the Nonproliferation Policy Education Center. "It appears to me the administration has negotiated an agreement it does not fully understand and I don’t understand how that can happen." "I don’t see how there’s going to be an agreement," he said. Iran, for instance, can continue to enrich uranium, the key component in a nuclear weapon, under the deal and continue to develop advanced nuclear apparatus. Jones said he could not envision a scenario in which Iran is stopped from building a nuclear weapon. Given these concessions, "I’m left with the impression the administration doesn’t really understand what it has negotiated," he said. 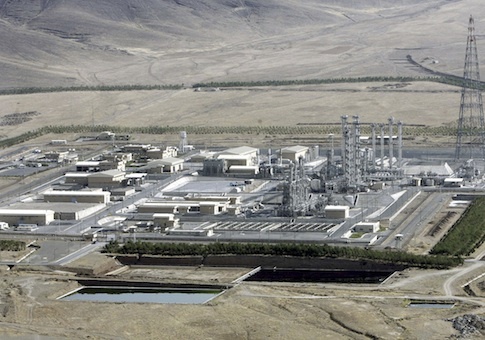 Iran currently has enough enriched uranium to build its first nuclear weapon in around two months. It could successfully build four weapons in around four to five months, Jones said. Rep. Ted Poe (R., Texas) also slammed the White House for hiding the details of the nuclear deal from the public. "I’m perplexed why it’s not" public, he said. "I still don’t know why it’s not. Iran is the mischief maker in the Middle East." Even if Iran dismantles 80 percent of its centrifuges, fully closes its nuclear site in Fordow, dismantles its heavy water nuclear reactor in Arak, and consents to nuclear inspections, it would "still be six months away from nuclear breakout," according to Rep. Ed Royce (R., Calif.), the committee’s chairman. "Iran will likely still possess the capability to very quickly produce a nuclear bomb," Royce said. Iran is already experiencing an economic boom as the United States begins to roll back sanctions, according to United Against Nuclear Iran CEO Mark Wallace. "The true value of sanctions relief is well more than $20 billion dollars," said Wallace, contradicting White House claims that the deal will give Tehran around $7 billion in relief. "Iran’s economy is blossoming." Iran’s stock market and currency has already experienced a sharp increase, and oil exports have risen significantly, according to Wallace, who pegged exports at around 1.2 million barrels a day. This entry was posted in National Security and tagged Ileana Ros-Lehtinen, Iran, Nuclear Weapons, Sanctions. Bookmark the permalink.